We are a highly acclaimed company that offers a quality range of Potassium Bromate for Baking Bread. All these products are quality tested on various parameters and are certified as per the international standards. These products are finely formulated by the team of skilled professionals of the industry that ensure their purity and reliability. These are packed in 25 kg HDPE woven sacks with inner lining or 25 kg HDPE drums with inner lining. 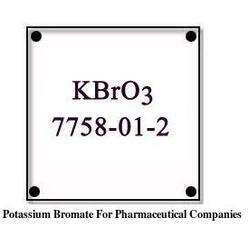 We provide Potassium Bromate For Pharmaceutical Companies. Known as a well known firm, we are engaged in offering a quality range of Potassium Bromate For Pharmaceutical Companies. Our products are highly appreciated for their purity, superior quality and long lasting effects. Highly advanced technologies and latest equipment are taken into consideration while making these products. Being a well known firm, we are engaged in offering a wide range of Potassium Bromate for Chemical Industry to meet the demands of our clients. These are safe to use and are widely demanded by our clients all over the nation due to their high quality and positive results. To add on, we are offering these products at nominal rates. 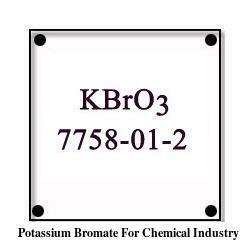 Looking for Potassium Bromate ?